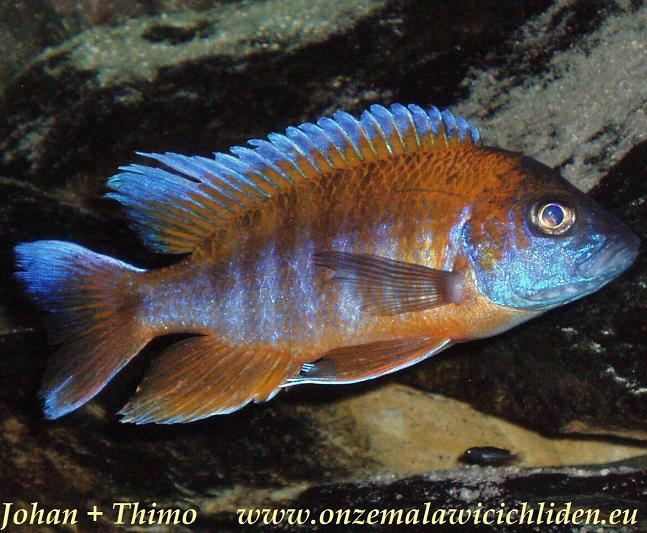 In trade Aulonocara jacobfreibergi is offered in different color variants. 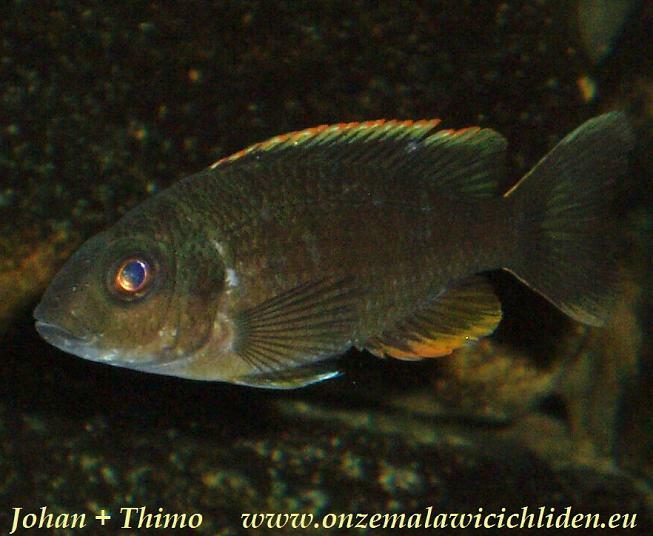 Young fish of this species all look the same, they all have the same brown stripe pattern like females. 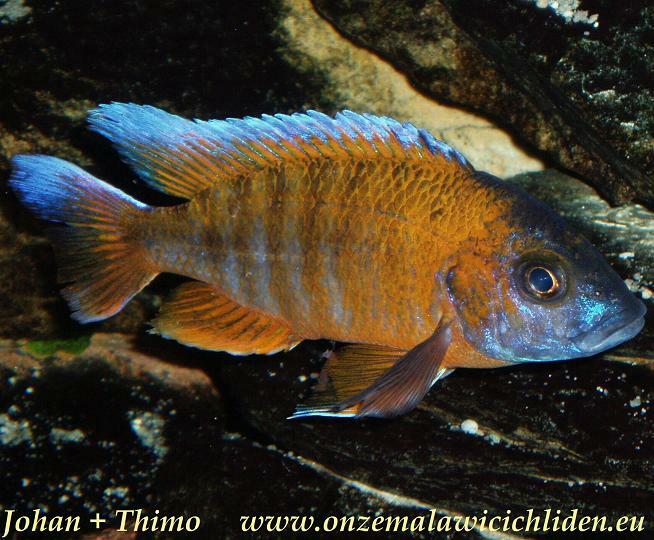 However when they grow older and the males start coloring it´s easy to detect the males because of the color and larger fins. 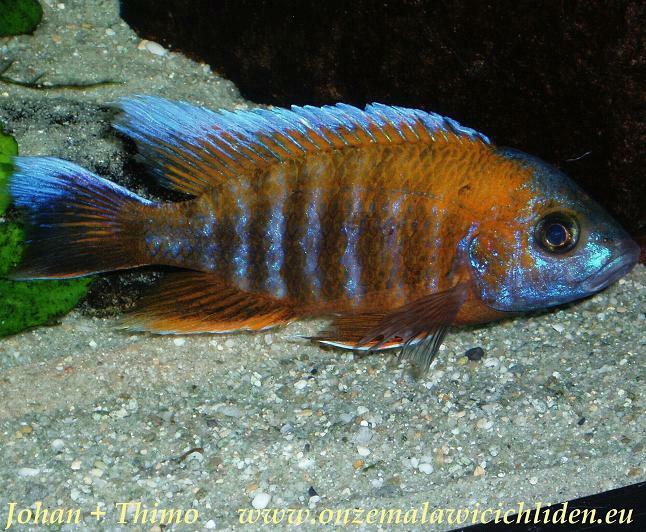 I have a group of Aulonocara jacobfreibergi "eureka" in my aquarium. 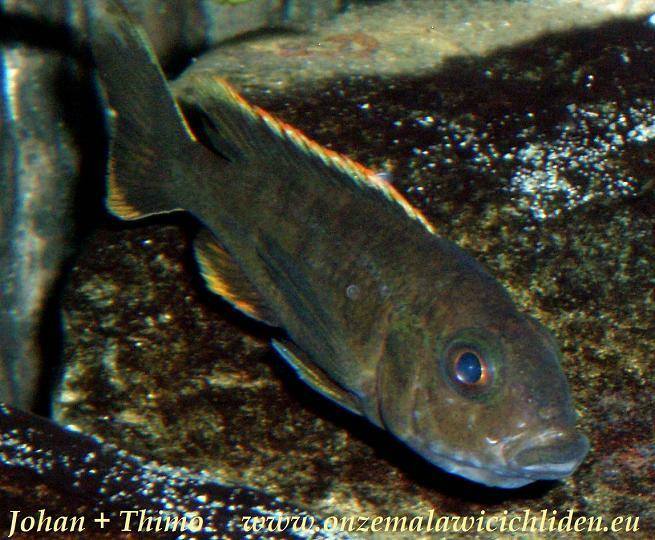 These fish love to stay between the rocks but mainly they stay at the edge of rocky areas. 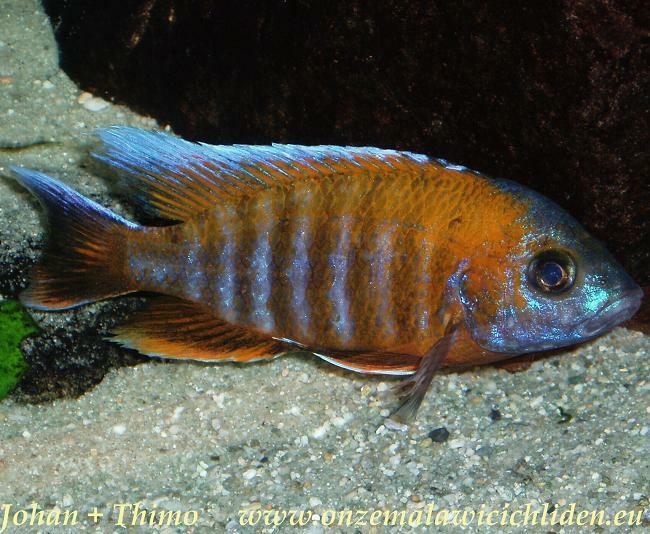 It is an Aulonocara type which is rather be able against the territorial behaviour of the "mbuna" than other Aulonocara types. About two years ago, I placed seven young fish in my aquarium. It appeared to be two males and five females. The males in my aquarium were about 12 cm when I decided to remove one of them because they were fighting and became more intolerant against eachother every day. They showed their most beautiful colors when they were fighting, though. Nowadays (september 2008) I have one male and three females in my tank and now they behave quite tolerant. They behave peaceful against other inhabitants except in mating-season, then the male chases any fish away that comes too close to his territory. I also have found some young ones of this species between the rocks. 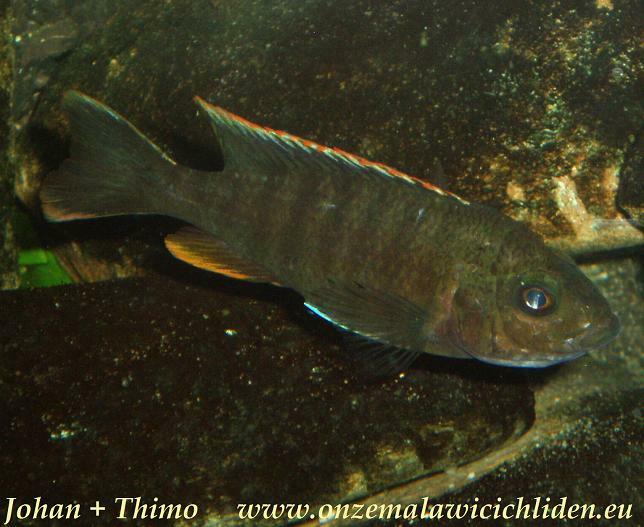 About the middle of 2010 I decided to remove them from my aquarium and replace it with another species. At that time I started keeping only "mbuna's" in this tank. 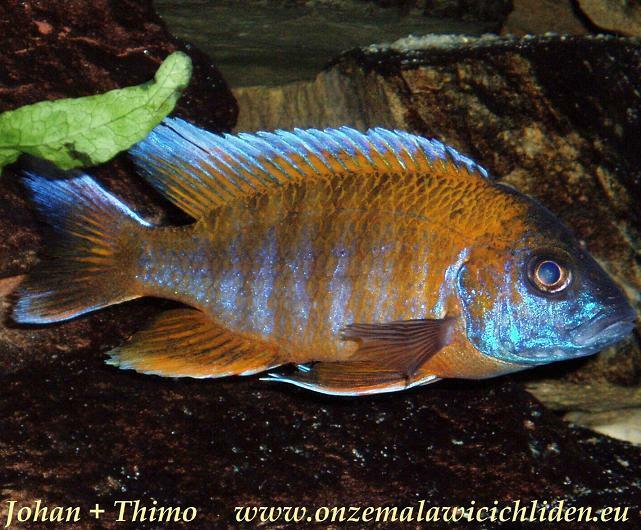 However I think this species is one the most beautiful and strong Aulonocara types. The pictures shown here are from 2007.